Well, here it is – your first day of school. You’ve been jumping out of your skin with excitement about this for weeks now. 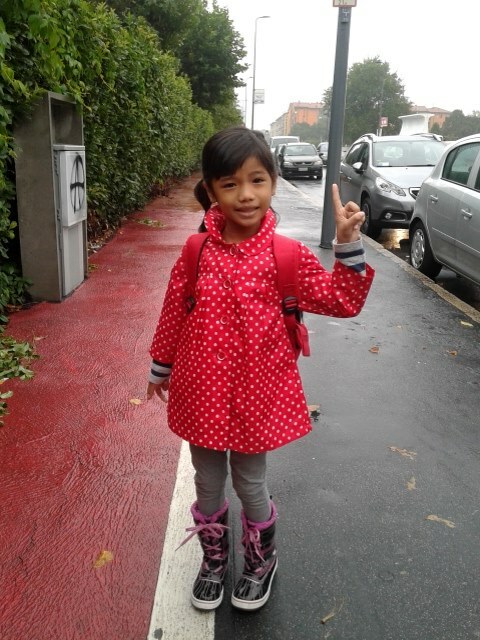 And today you joined thousands of other kids in Milan to embark on your very first day at primary school. This morning when we arrived at your new school, you held my hand and literally shy away from the new faces you’ve seen. Yet, you’re excited about what this day would bring. When the teacher asked to leave the room and to say goodbye, you were teary-eyed, but i assured you i am just around the corner, just to lessen your “fear” of being a “newbie.” Then i finally left and waved at you out of the classroom. I won’t deny the fact that i was a little emotional as i left you in that classroom … because it’s difficult to fathom that my baby girl is so ready to be a school girl. Today you start on a journey of learning that will see you through your childhood and, hopefully, contribute in shaping you into a happy, successful grown up. Today is a momentous first step on your life’s journey and I feel so honored to be witnessing your world opening up. No matter what, I will always be here on the sidelines to support you and cheer you on.